At the mid summer of 2013, a snapshot of the Krita code project -my main digital-painting tool- has been released under the version numbering 2.7. This new version, coming only 6 month after the last 2.6 brings a lot of new fix and features. To be fair; an amazing amount compare to the small team size and other projects I keep watching. I focused myself while writing this article on making a review with screenshots (click them to enlarge them) of the new features to help other users to keep track of the changes. You might not ignore I'm connected everyday to the IRC krita chat channel and I am also reading every days the last GIT repository comments and build the last code, and I also fill as much as I can the bug tracker. So, I gather rather well all this kind of informations; and time now is to share what happened the last 6 months. I also hope to share my passion about this amazing software and promote the cool work made by the passionate development team. And about promoting, feel free to reuse this pictures and text, they are published here under a Creative Commons Attribution 3.0 Unported License. The pixel brush and the smudge brush engine among other 'pixel based' brush-engines get a new feature ; the possibility to add a 'texture' blended in the strokes. Combining the texture with the pressure of the stylus in subtract or multiply mode, you'll be able to give more life to your strokes, set a cut off and a scaling to better simulate paper grains, canvas pattern, and other textured effects. 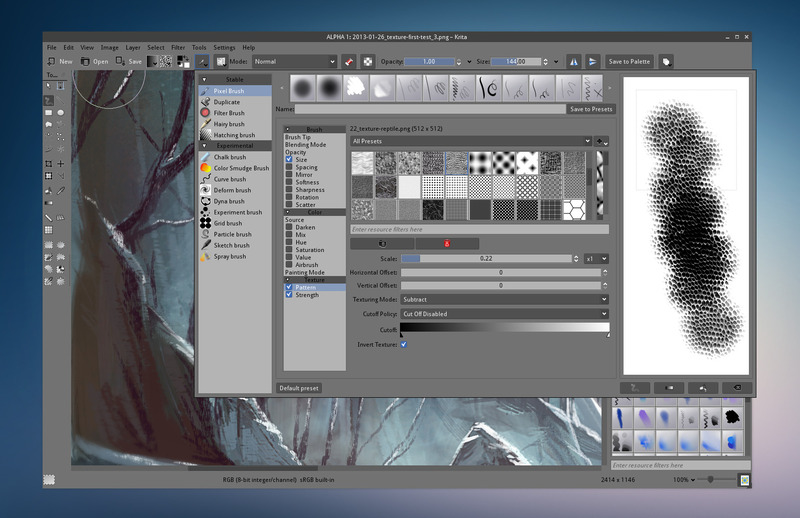 All my textures pack ressources has also been added by default into Krita. I'm really happy with this feature, and that's probably because I could help describing the effect I was looking for, and had a result perfectly adapted for my workflow. The transform tool received a lot of improvements, and now can perform really complex task and *really* fast. And by really fast, I mean the fastest on-canvas of all the open-source raster image program I know. If you have a lucky high CPU, it will perform complex resize and rotation of high-res layers in the blink of an eye. More details of all the features of this tool on the demo video I did bellow. 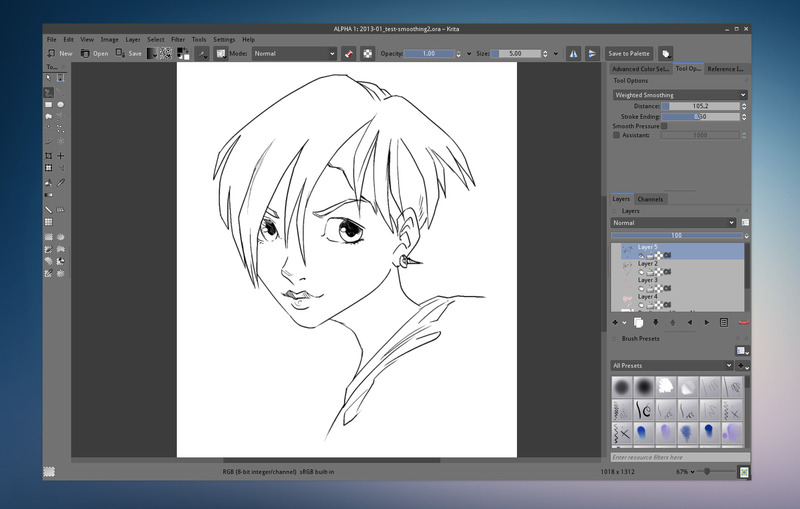 This feature was a long waited feature by comics and anime artist ; you can now setup smoothing methods to your strokes, so your line-art will appear less 'shacky' and smoother, even with a small tablet and a thin brush preset. It can be easily compared to the 'stability' feature found on other proprietary software, just with more control on the sliders and not only a range of stabilization presets. 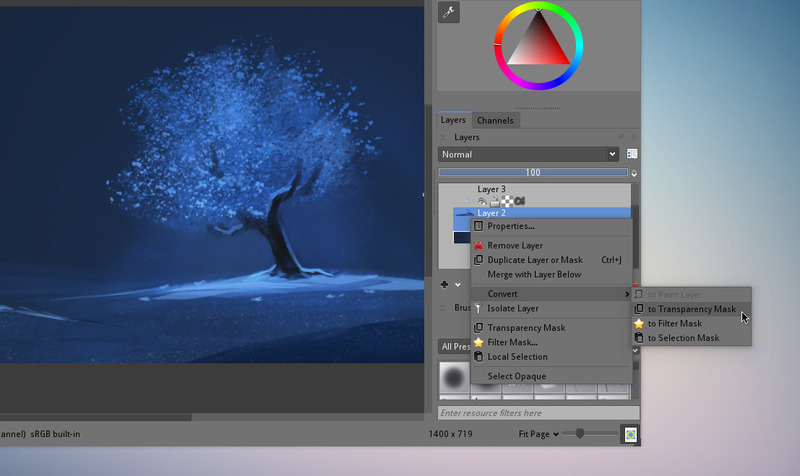 Krita layer stack received also a major feature with the 2.7 release. 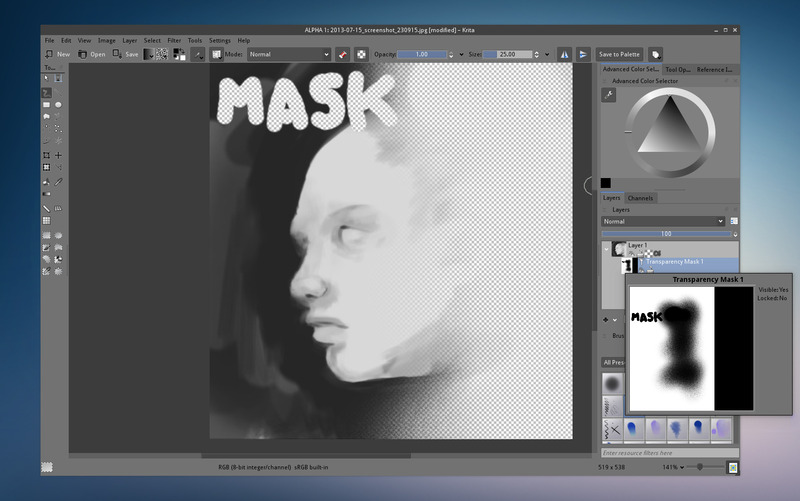 It's now possible to paint transparency mask using black&white (and all the gradients of grey). It allows you a fine control and flexibility on transparencies, selections, and possibility to reuse mask. You can drop any image to Krita canvas. For example, you can drag an image from your browser or from your file manager to add it as a new layer layer. You can also drag-and-drop more than an image at once or drag-and-drop of layers between different instances of Krita opened. You can remove in one click most of the background of your scanned artwork with the color to alpha filter feature , it is simple and more powerfull than a simple selection color based and erasing: Color to alpha ( you'll find it in the filters ) is able to perform same result you usually obtain when you put your line-art as a layer in the "multiply" layer blending mode. The composition docker is used mostly for keeping visibility state of layers and help for the creation of storyboard sequence. The feature received the possibility now to browse the stack using the up and down arrow when focused. So, you can playback your sequence with the key. The visibility states can now being exported all together with a single new button on the docker. If you want more infos on the usage of the composition docker, check my video here . 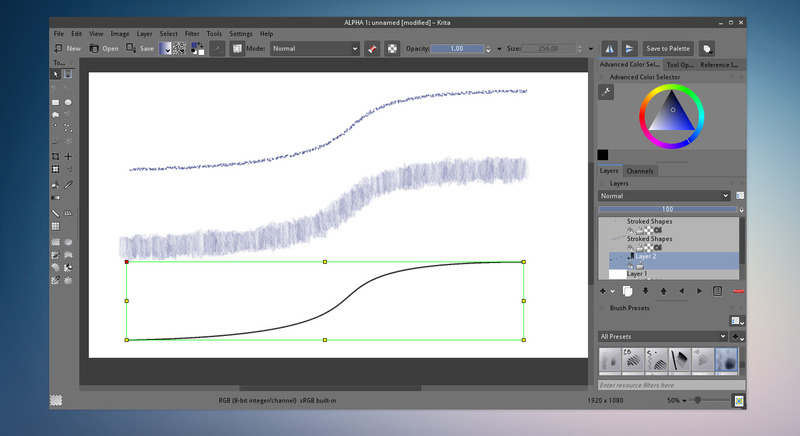 You can now tweak the alpha channel of a layer with the curve filter. This feature is usefull to clean alpha by filtering it. So, you can contrast now the alpha of a layer, wich is cool to clean small artefact if you create graphics on alpha background. On the screenshot under, I played to increase the alpha variation of a paint pass layer on one of my doodle. This is pointless, but shows the filter in action. A new image modification method to offset your image (so all your layer stack). A precious tool to offset the image (at half) and help you to create seamless textures because the corners and edge of the image suddenly will switch at the center of the transformed image. Then you can paint-over or tweak the bad transition. Applying it again, make your image going normal , but if you did well the cleaning job, you'll have a seamless image. I played with it lastly for my website background image. More infos on the method on this video made by Mifth. Vector shapes (on vector layers) done in Krita can be 'replayed' like a stamp using a a brush preset. The result: you get rendering of the outline but this time with a bitmap brush. It will certainly help the control freaks among perfectionist artist who look for the precision of a stroke with bitmap result and vector handles. Find the feature after selecting a vector shape into the top menu: Edit > Stroke selected shape. You can convert a paint layer to a masks and also the inverse using a right click over the layers. 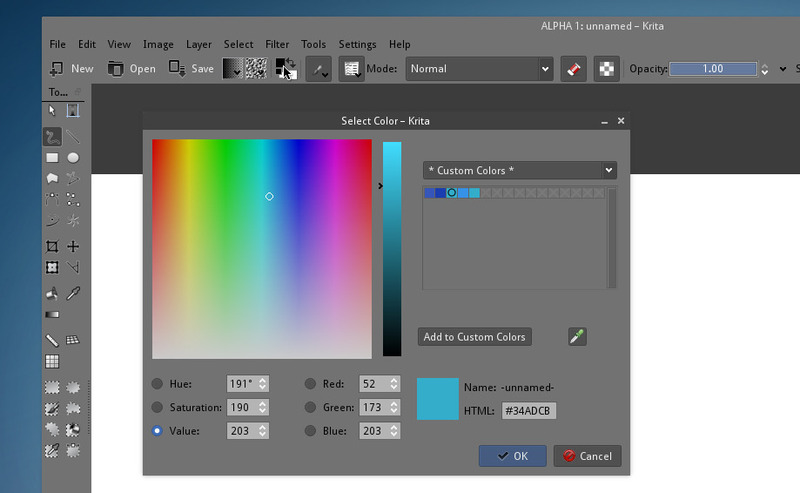 Double click the color button on Krita toolbar (see the screenshot to see where the pointer is) to open a new color pop-up menu, allowing color picking outside of Krita, having a mini palette, HSV and RGB color selection with numeric precision and Hex colors for those who works with webdesign. When you set custom slider on the top of the screen (opacity/ flow / size), Krita will remember this change at next opening. Same if you set preferences for the display of the layer stack (minimal /detailed / thumb). 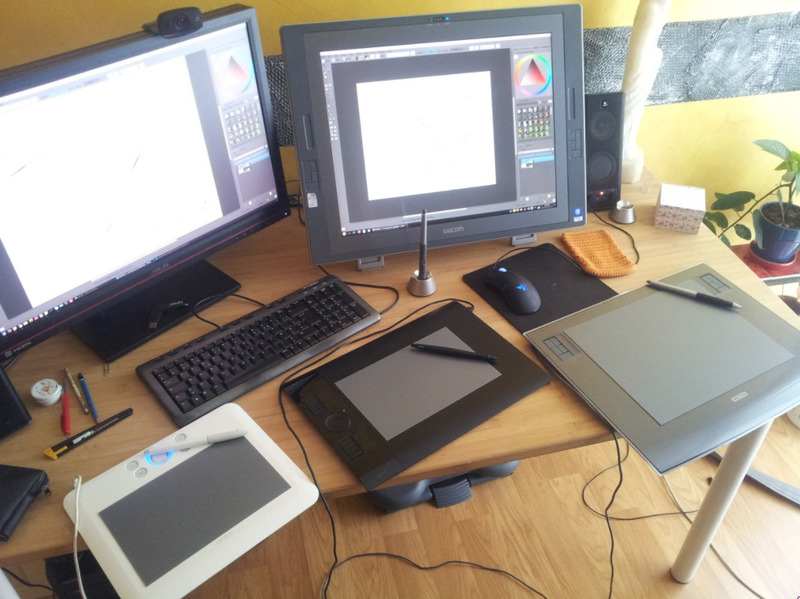 Multiple Wacom tablet handling is now possible as well as using them on multi-screen. The photo here is a bit extreme; but was a successful test at home with a Cintiq and three other tablet connected. 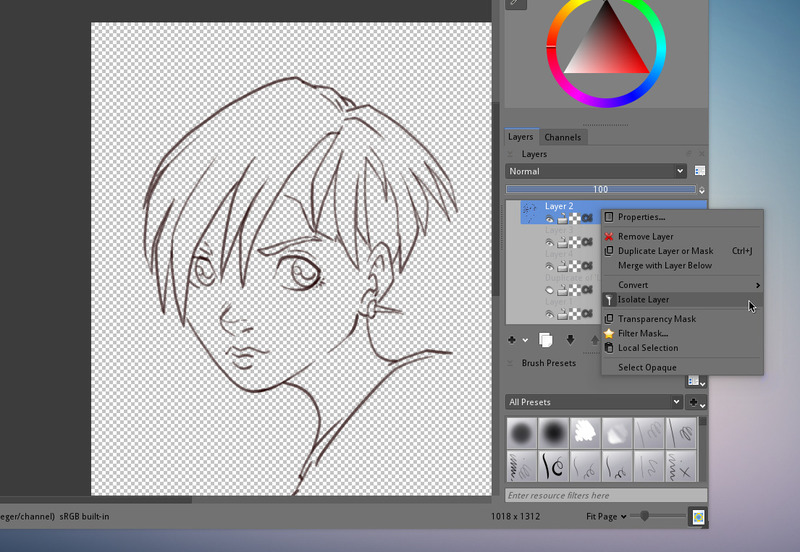 Drawing simultaneously on two instances of Krita opened on two different screens. This feature helps octopus user with a Cintiq or a laptop with an active screen reacting as a tablet plus an external classic tablet connected. / ('divide' symbol numeric keypad) switch last preset selected with current ; useful to store a drawing tool and a eraser , or a paint tool and a smudge brush. I'm really addicted to it, and got a Wacom button shortcut now for it I press every seconds. Now the crop tool is fixed and when you apply it, it keeps the image on screen without changing the zoom and placement. Smudge / Dulling brush engine: epic fixes for artifact problems. Improved interface for resource tagging. Windows and Linux user; everything should be indicated for you here: http://krita.org/download ... but ! ... I think the page is not really updated or tested, and most of the method I see doesn't look safe or enough tested in my opinion. This page would certainly need some maintenance and love, so don't hesitate to contact the Krita team if testing methods on a virtual machine doesn't make you affraid. This would be a super valuable contribution! Thanks in advance. A new version of Krita is unfortunately and -from my experience- really hard to install on Linux (and I precise again: if you want a version outside the one provided by your default distribution). The reason is probably linked to the amount of libraries, dependencies to KDE, Qt and Calligra project , but also many other little libraries. Most of this needs to be updated as well, and at the end, it's a whole system you'll update for only an apps... I feel sometime like running something as fragile as the rain forest ecosystem on my system. All is built around the possibility to run, compile Krita in the most stable environment possible, because I work daily with it. It can be even harder if you are especially on a 'buntu base Linux system in my opinion. I had problems with 13.04, with XFCE's Ubuntu Studio, with Gnome and Unity too when I tested three weeks ago; and a lot of issue came from the Ubuntu base itself. A really updated Linux distribution as Arch Linux probably got 2.7 already into the packages ready to update or install. 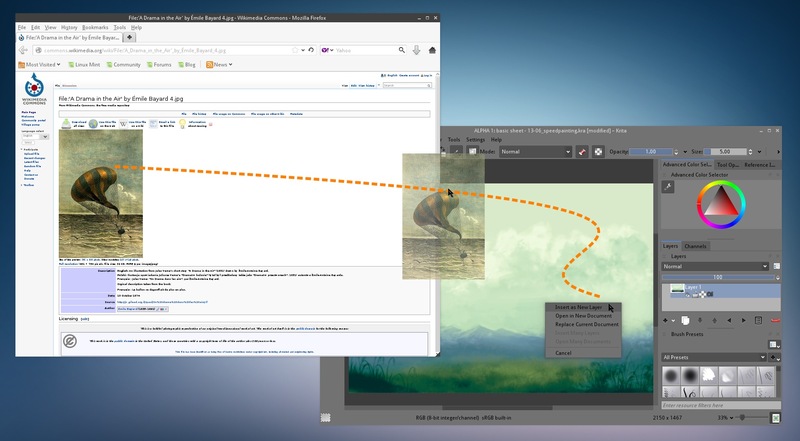 Krita developpers use KDE on OpenSuse or Fedora KDE spin. But they are a majority of OpenSuse user as far as I know. My own method for the moment is to use my compilscripts to keep compiling the last development version (so actually the start of what will be Krita 2.8), so I would recommend this way as it is the only one I tested working on my Linux Mint KDE 14. To conclude, feel free to use and read the comments of this article to share your tips, and installation environment : some of you probably found a way to get 2.7 or compiling 2.8dev simply , and I think many readers would be interested by it. Oh, and while I'm promoting Krita, don't forget if you can help by giving them a small donation or buying a merchandise ; having more funds can boost the project a lot. License: CC-BY David Revoy, www.davidrevoy.com, 5 august 2013 . Very nice, thank you for that quick and clear guide. I had heard about a timeline for animation. Is that the composition dock or is it a project still in dev (if you know...) ? 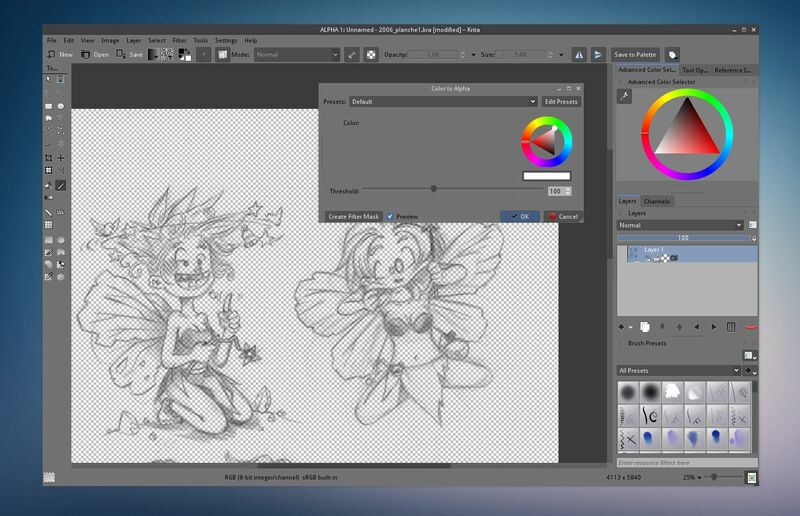 Nice article, it's good to hear of so many new features introduced in Krita by its enthusiastic dev team. Thanks David! Have a nice holiday! 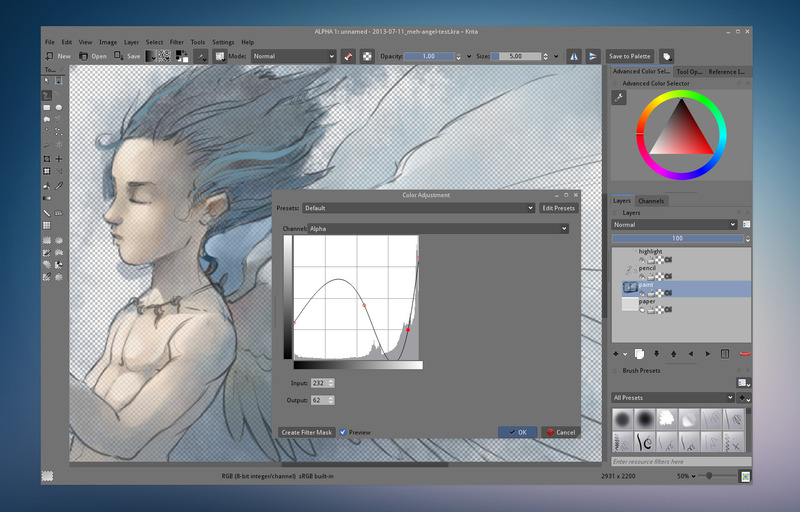 There is a simple way to install Krita 2.7 in Ubuntu via ppa. Just add kubuntubackports/ppa and install Krita 2.7.1 . Sometimes Krita don't start so there is a need to install kde-base package from Synaptic. I use this method for a long time and it works flawlesly. I know you no longer use GIMP (for painting) but i saw some features here that already exist on it. So based on your last experience with GIMP, how would you compare them? Dear David, thanx a lot for this great article, but I didn't understand what you mean at the end of it. You wrote there "A new version of Krita is unfortunately and -from my experience- really hard to install on Linux (...). 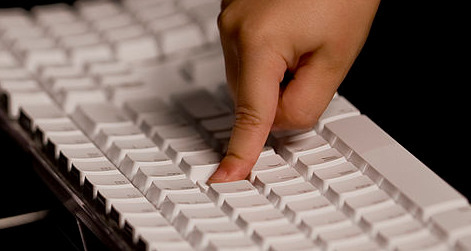 The reason is probably linked to the amount of libraries, dependencies to KDE...". 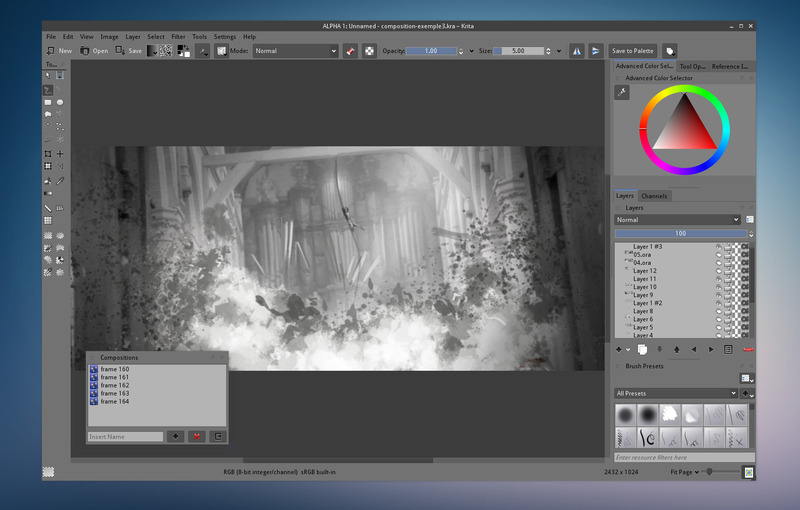 So HOW one can get the right Krita version that contains all above feature and works well on modern distribution of Linux? Either via PPA or your "compilscripts" that were updated in july 2013 ? What do you recommend ? Hm, the Kubuntu backports ppa works fine for me -- at least, in a new vm. For the rest, apart from Project Neon, most of these methods of updating should be pretty safe, actually. Awesome write-up! Thanks for going over the new features. I just upgraded to 2.7 and was wondering what had changed. Looks like there are some excellent imporvements. 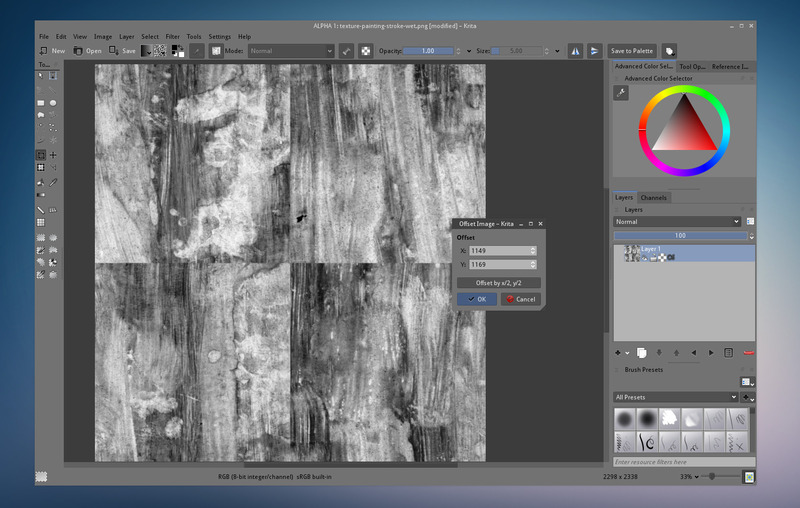 Krita really is an excellent replacement open-source replacement to Painter/Photoshop (especially for Linux users). I mostly paint in MyPaint because of it's simplicity, but I'm going to start using Krita more now I think. You should do a digital painting class like Chaos & Evolution but using Krita! Thanks for going over these! I had a lot of problems with Krita crashing on startup recently (using standard version Ubuntu), and eventually I gave up and installed kde-plasma desktop; now I just have to log into that desktop environment and Krita works fine with no problems. It's a bit of a pain (I actually LIKE Unity) but I'm much happier having it work. @Chris : I agree, I had by the past to work on projection of paintings into cylindrical object ; and I worked it using Blender. The current transform tool ( even all the mode of Warping ) can't perform that. @cactus dad : hi, sorry. I don't know about it ; I have very little interest into mac and windows system , I use Linux only at home for everything since more than 5 years. Good luck for your research. @Bubble :  I just checked again, and the Crop tool , in tool option , has a checkbox option named 'grow' ; if you check it, you'll be able to start tracing cropping zone from center origin.